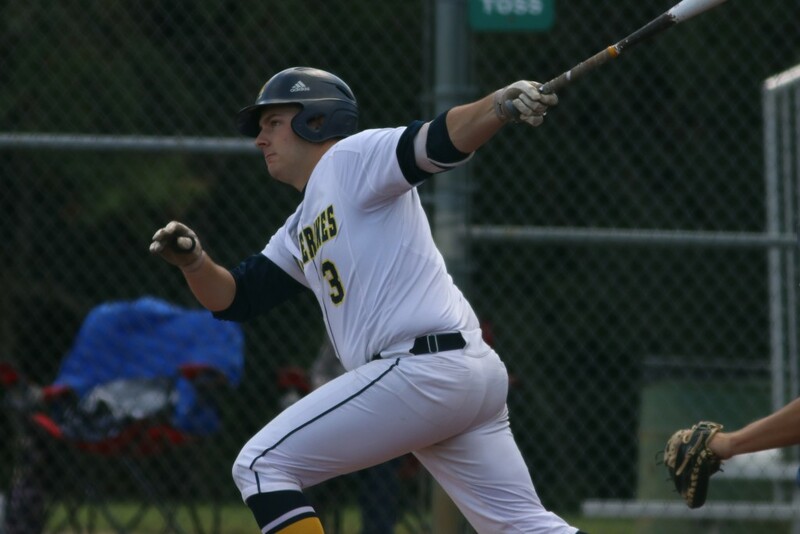 After a rain-shortened week that saw them play just two games, the University of Michigan-Dearborn baseball team had to play eight contests this week. They got the busy schedule started on Monday as they played their second doubleheader in a week against the Cougars of Cleary University in Howell, Michigan. The Cougars beat the Wolverines in both of the prior two games. In the first contest of the day, both teams came out swinging and combined for seven runs in the opening frame which resulted in Clearly holding a 4-3 advantage. The Wolverines then took control in the third and fourth innings. A triple by junior Patrick Downing, a single by sophomore Jon Quintal, and a couple of Cougar errors in the third allowed the Wolverines to take a 7-4 lead. In the fourth, doubles by Downing and junior Ryan Beadle pushed the lead to 10-4. UM-Dearborn’s offense was not done as they added another five runs in the sixth inning off of doubles by junior Antonio Carta and senior Daniel Kerr. The 12 unanswered runs gave them a 15-4 lead. Cleary was able to get two runs in the seventh and three more in the eighth, but the Wolverines held on to take the first contest 15-9. Sophomore Dan Bos got his first win of the season. Although they struck out 10 times, Wolverine hitters exploded for a combined 19 hits and six walks. Seven different players had multi-hit games and recorded at least one RBI. Kerr led the team with three hits, three RBIs, and two walks. Downing added another three hits and three RBIs. Sophomores Andrew Capone and Shaun Hannibal also had three hit games with Hannibal adding an RBI. Beadle and Carta each finished with 2 RBIs as well. Bos got the start for the Wolverines and overcame a rough first inning to shutout the Cougars for his remaining four innings of work. Over five innings, he allowed four runs on six hits and four walks while also striking out four. Senior Nick Montroy relieved him and went two innings, giving up two runs on two hits. Junior Justin Marshall closed out the game and surrendered three runs on three hits and struck out two over the final two innings. After the second game opened with each team getting one run in the first inning, Andrew Capone hit an RBI double to give the Wolverines a 2-1 advantage in the top of the fourth. In the bottom of the frame however, the Cougars erupted for six runs and took a commanding 7-2 lead. Walks by Shaun Hannibal and Daniel Kerr in the sixth and a Capone single in the seventh brought the Wolverines to within two. Cleary then answered right back with two runs in the bottom of the seventh. Ryan Beadle brought in two runs with a single in the eighth, but the Cougars were able to hold on for the 9-7 victory. Wolverine batters were not as explosive as they were in game one, but were still very productive. They finished with 11 hits and six walks. Beadle was the most impressive, going 4-5 with two RBIs. Other notable performances were by Capone, who had two hits and two RBIs, and sophomore Justin Dolney, who added two hits and an RBI. Junior Jack Hook started and picked up the loss. He went 3.2 innings and gave up seven runs on six hits while striking out two. Sophomore Cameron Tubbs relieved him and allowed one run on two hits and four walks over 2.1 innings. Freshman Robert Begley pitched the final 1.2 innings and surrendered a run on two hits. On Tuesday, the Wolverines traveled to Ilitch Ballpark in Livonia, Michigan to take on the Wolverine Hoosier Athletic Conference-leading Crusaders of Madonna University in a doubleheader. The games were rescheduled from last weekend. In the first game, Andrew Capone scored on a wild pitch in the first inning and then tripled home two runs in the second inning to give UM-Dearborn an early 3-1 lead. Madonna was able to score two runs in the fourth and one in both the fifth and seventh, but another Capone RBI in the fourth and RBI singles by Ryan Beadle in the fifth and Antonio Carta in the seventh helped the Wolverines maintain a 7-5 advantage entering the eighth inning. Madonna tied the game up at 7-7 in the top of the frame, but a single by Kerr and a three-run blast from Justin Dolney allowed the Wolverines to retake the lead at 11-7 entering the final inning. The Crusaders were able to get two runs and make things interesting, but UM-Dearborn held on for the 11-9 victory. For the second time in three games, the Wolverine hitters were able to get double-digit runs across. They combined for 14 hits and three walks. Dolney’s home run and Capone’s three hit and three RBI performance led the team. Kerr, Beadle, Downing, and senior Waymond Lemon Jr. all had multi-hit games. Beadle and Kerr each added an RBI while Lemon Jr. scored an impressive three runs. Sophomore John Dyda opened the game and went a solid 6.1 innings, allowing five runs (four earned) on seven hits and five walks while striking out an impressive six batters. Sophomore Ramiro Rodriguez then came on to pitch 1.1 innings and gave up two runs (none earned) on two walks. Senior Matt Buhagiar picked up the win in relief by going the final 1.1 innings and surrendering two runs on three hits and also striking out two. 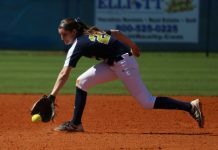 Although the Wolverines were led by their offense in the first game, pitching took center stage in game two. Freshman Garrett Davis started the game and dominated the Crusaders through the first eight innings. He allowed just one run on six hits and struck out five batters. UM-Dearborn helped Davis out offensively by scoring six runs in the third inning. Shaun Hannibal, Daniel Kerr, Antonio Carta, Andrew Capone, and sophomore Jacob Leija were all credited with an RBI in the inning. Leija and Capone each added an additional RBI in the sixth to give the Wolverines an 8-1 lead entering the ninth inning. In the ninth, an error by the Wolverines and a double and a walk for the Crusaders ended Davis’ impressive outing. Junior Tanner Hodges was then brought in and secured an 8-4 Wolverine win. Davis picked up his third win of the season and was close to pitching a complete game. He was outstanding in his eight innings of work, allowing four runs (one earned) on seven hits and two walks while striking out five. Wolverine hitters continued to impress by recording nine hits, drawing an incredible 11 walks, and only striking out four times. Leija led the way with two hits and two RBIs and Carta added two hits and one RBI. Downing also had two hits while Capone drew four walks and recorded two RBIs. 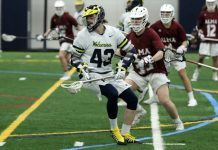 The Maize and Blue then faced the Saints of Aquinas College in a doubleheader on Saturday at Kimble Field in Grand Rapids, Michigan. Aquinas opened the scoring in game one with a run in the second before Ryan Beadle tied the game with a single in the top of the fourth. The Saints then scored two runs in the fourth and sixth innings to take a 5-1 lead. Justin Dolney was able to trim the deficit to 5-2 in the seventh, but the Wolverines big rally came in the ninth. Shaun Hannibal and Daniel Kerr led off with back to back singles and then Dolney and Beadle knocked them in to make it a one run game with two outs remaining. After Antonio Carta walked, Jacob Leija tied the game with an RBI single. Walks by Waymond Lemon Jr. and Andrew Capone and singles by Hannibal and Kerr allowed the Wolverines to take a commanding 10-5 lead. A sacrifice by Downing added another run for UM-Dearborn before sophomore Cameron Winn shutdown the Saints in the bottom of the frame to give the team an 11-5 comeback win. 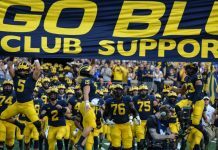 The Wolverines showed tremendous heart in their comeback effort. They again had double-digit runs, nine of which came in the final inning when they absolutely needed them. They also finished with 15 hits and 10 walks. Hannibal and Downing each had three hits, one RBI, and two runs scored. Kerr, Beadle, Carta, and Leija all had two hit games and Kerr and Beadle also had two RBIs each. Leija added another RBI and drew two walks. Junior Malcolm Harris started and pitched five quality innings. He gave up three runs (two earned) on five hits and also had one strikeout. Jack Hook got the win in relief, going three innings and giving up two runs (none earned) on three hits. Winn got a one-two-three inning to close out the game in his only inning of work. UM-Dearborn carried the positive momentum from game one into the second game and jumped out to a 3-0 lead in the top of the second. Aquinas answered with two runs in the bottom of the inning, but the Wolverines dominated the Saints the rest of the way. Starter Ramiro Rodriguez was lights out on the mound and the offense continued to play at a high level. The Wolverines scored two runs in the fourth and fifth innings and added three in the sixth and another four in the seventh to take a 14-2 lead. Six different Wolverines recorded an RBI during the four inning stretch. Most notable was Ryan Beadle, who hit a two-run shot in the fifth and had an RBI single in the seventh. Cameron Tubbs then came on and closed out the game to give the Wolverines a 14-2 win for their second straight doubleheader sweep. The Wolverines offense continued to shine as they put across an incredible 14 runs. They also had 14 hits and nine walks. 11 different players recorded at least one hit with Beadle leading the way with his 3-4 performance that included a home run and three RBIs. Daniel Kerr also went 2-2 and Shaun Hannibal added three RBIs and two walks while Tanner Hodges brought another two runs home. UM-Dearborn also got a tremendous outing from Rodriguez. Through his six innings of work, he gave up just two runs on five hits and only one walk. He also struck out an impressive seven batters. The Wolverines closed out the week by playing the Gray Wolves of Lourdes University in a doubleheader on Sunday at Mercy Field in Toledo, Ohio. Sophomore John Dyda got the start for the Wolverines in game one and was impressive through the first five innings, striking out seven and allowing just one run in the second and fifth innings. UM-Dearborn helped Dyda out in the bottom of the fifth by getting four runs and taking a 4-2 lead. Andrew Capone, Daniel Kerr, and Shaun Hannibal knocked in the runs. Dyda allowed two runs in the sixth and another in the seventh and the Gray Wolves retook the lead 5-4. Patrick Downing drew a walk to tie the game in the bottom of the seventh. The remainder of the game was scoreless and the teams headed to extra innings. Lourdes got one run in the top of the tenth and shut down the Wolverines in the bottom of the inning to take game one 6-5. Although he ran into trouble late, Dyda was impressive over his 6.1 innings of work. He finished with eight strikeouts and allowed five runs on six hits and four walks. Nick Montroy relieved Dyda and pitched the next 0.2 innings. Matt Buhagiar then pitched 2.2 innings and picked up the loss, surrendering one run on two hits and two walks while striking out two. Tanner Hodges pitched the final 0.1 innings. The Maize and Blue hitters finished with six hits and seven walks. Kerr went 2-4 with two RBIs and a walk. Capone, Hannibal, and Downing all added an RBI as well. In the second game, Jon Quintal and Waymond Lemon Jr. got the Wolverines on the board early with two runs in the second inning. Both teams went back and forth through the middle innings. Lourdes scored a run in the third, fifth, and sixth innings and UM-Dearborn answered by scoring one run in the third, fourth, fifth, and sixth to take a 6-3 lead. Most notable was Lemon Jr.’s solo home run in the sixth. In the seventh, the Gray Wolves hit two two-run homers to give them a 7-6 advantage. Lourdes added two more runs in the top of the ninth to extend their lead to 9-6. Walks by Daniel Kerr, Patrick Downing, and a Lourdes error loaded the bases for the Wolverines with two outs in the bottom of the ninth. Antonio Carta then came through in the clutch with a pinch-hit single that scored two runs and advanced the tying run to third. UM-Dearborn was unable to get the tying run across and the Gray Wolves won the game 9-8. Although they lost another heartbreaker to Lourdes, the Wolverines never gave up and put together a great rally. They finished with 11 hits and four walks. Lemon Jr. led the team with his 2-4 performance that included a home run and two RBIs. Shaun Hannibal and Downing also had two hits with Hannibal adding an RBI. Garrett Davis started for the Wolverines and threw 5.1 quality innings, giving up three runs on five hits, six walks and striking out two. Freshman Jacob Lapham relieved him and picked up the loss. He pitched 1.1 innings and allowed four runs on three hits and two walks. Jacob Leija went 1.1 innings and surrendered two runs on four hits and a walk then freshman Tyler Troyer put down all three of the batters he faced in the ninth. 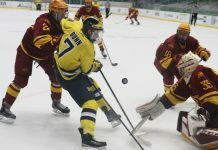 The Wolverines had a great week of play, despite dropping both game to the Gray Wolves. They went a solid 5-3 to improve their record to 15-16-1 overall and 8-4 in the WHAC. They next travel to Spring Arbor University on Thursday to take on the Cougars in a doubleheader at 2 p.m.